Luxury silk scarf inspired by the exotic bird of paradise flowers exhibited in Kew gardens. This vibrant purple mix scarf represents a unique piece of wearable art. 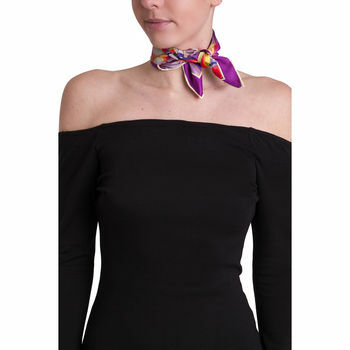 Rich floral design in a mini scarf cut to size for a perfect and stylish neckerchief.